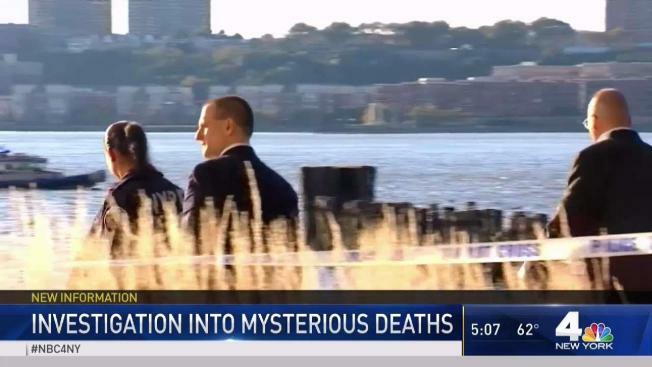 The investigation into the mysterious deaths of the sisters who were found dead, fully clothed and bound together in the Hudson River last week continues as NYPD ask the public for help in getting information. Marc Santia with the latest. Two sisters from Virginia who had been missing since August were found dead, fully clothed and bound together in the Hudson River last week -- and law enforcement sources say investigators have reason to believe they went into the water alive. The medical examiner's office has said it's still not clear how Rotana and Tala Farea died, but the sources say there is no information to suggest foul play or an honor killing in the mystifying case. The mother of Rotana Farea, 22, and Tala Farea, 16, told detectives the day before the sisters' bodies were found, she received a call from an official at the Saudi Arabian Embassy ordering the family to leave the U.S. because her daughters had applied for political asylum. An NYPD spokesperson said Thursday that the girls were last seen in Fairfax, Virginia, Aug. 24. However, it remains unclear when the sisters left Fairfax. Through credit card payment tracing, police know the sisters left Fairfax, went to Washington, D.C., then Philadelphia, before arriving in New York on Sept. 1, police say, adding that they are tracing other payments to Manhattan restaurants and hotels after Sept. 1 in search of video and witnesses. The sisters were found in the water off Riverside Park a week ago, Oct. 24. They were tied together at the waist; they were facing each other. Both had on coats. They had no signs of trauma to their bodies, but the AP reports that fact could rule out an initial theory the two may have jumped from the George Washington Bridge. Initial autopsies required more analysis, the medical examiner's office previously said. A cause and manner of death for both remain undetermined. That lack of determination makes a comment made by NYPD Chief of Detectives Dermot Shea at an unrelated news briefing Tuesday that much more poignant. "We are out to get justice for those two girls," Shea said. Shea said the initial priority was to identify the pair. That done, he says investigators are looking into whether there could be clues in Virginia that could help develop a timeline of where they were the last few months. Why were they in New York City? Why did they leave Virginia? Shea said those were some questions detectives would look to answer as the investigation develops. Tala Farea was last seen Aug. 24, according to the National Center for Missing and Exploited Children. The organization had said she may be with her sister. The two moved to the U.S. from Saudi Arabia with their mother in 2015, settling in Fairfax, Virginia. Rotana Farea was enrolled at George Mason University but left in the spring. A George Mason spokesman called the news of her death “tragic,” and said the university was cooperating with police. Police said the sisters left their family home and were placed in a shelter after an earlier disappearance, in December 2017. They disappeared again about six months later. Little is known about their activities from then until Oct. 24, when they were found on a bank in the Hudson about 225 miles from their home. The NYPD now says they may have been staying in the New York City area during the time they were missing. In its statement, the Saudi Consulate General said embassy officials in Washington had contacted the family and “extended its support and aid in this trying time." It said the sisters were students “accompanying their brother in Washington." Anyone with information is asked to call authorities.